This is the first new thing I’ve cooked in 2011. And if it’s any indication of the year to come, 2011 is going to be delicious! This was so good, so fast, and I just threw together some roast potatoes while I was getting the chicken into the oven. Easy peasy winter dinner. Seriously, this is the best thing I’ve made in quite a while. I was worried about 2 things at first: The recipe calls for chicken thighs, which are not Adam’s favorite. And I was worried that it would be a sticky, gooey piece of chicken covered in honey mustard. 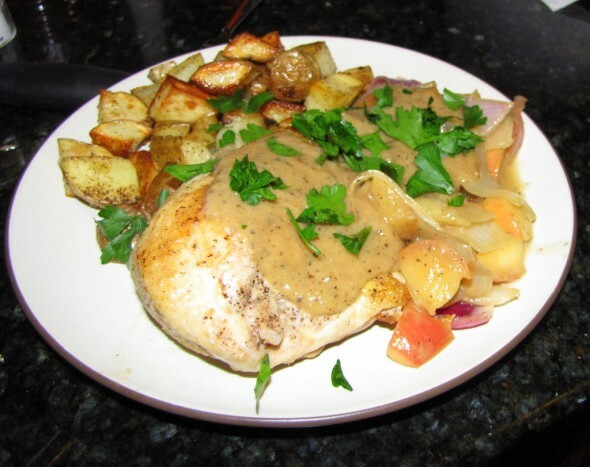 So I used 2 skin-on, bone-in breasts instead of 4 thighs (the original recipe calls for 8 thighs and serves 4, but I still halve everything), and I now know that the sauce is more of a slightly tangy, slightly sweet gravy. It’s fantastic. I’ve added my own roast potatoes recipe at the very bottom for anyone who’s interested! 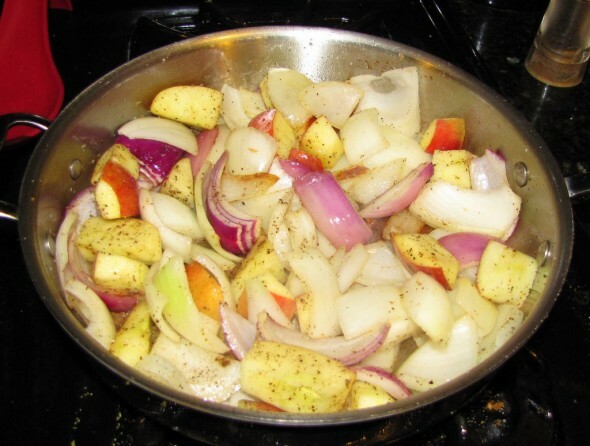 Add the onion and apples to the skillet and season with salt and pepper. Cook until slightly softened, about 4 minutes. Mix the broth with the mustard, then add to the skillet and bring to a boil. 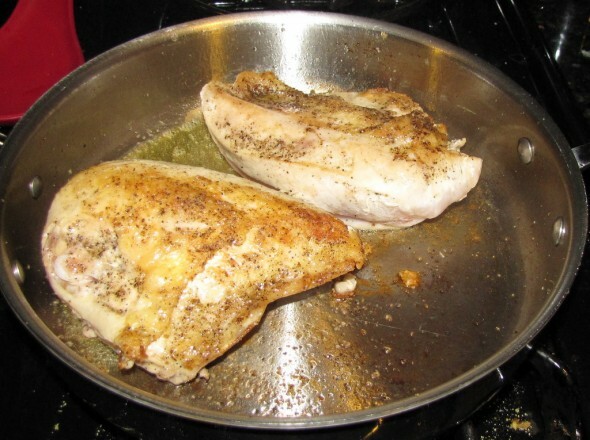 Arrange the chicken, skin-side up, in the skillet. Transfer to the oven and roast until the chicken is cooked through, 15 to 20 minutes. Mix the butter and flour to form a paste. 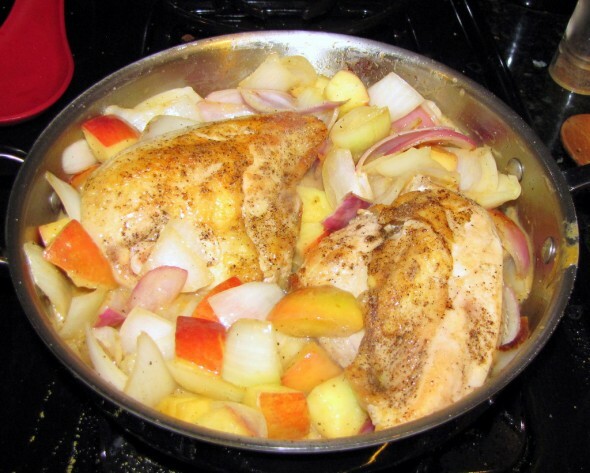 Use a slotted spoon to transfer the chicken, apples and onion to plates. Bring the pan juices to a simmer, whisk in about half of the butter-flour mixture and boil to thicken, 2 minutes. 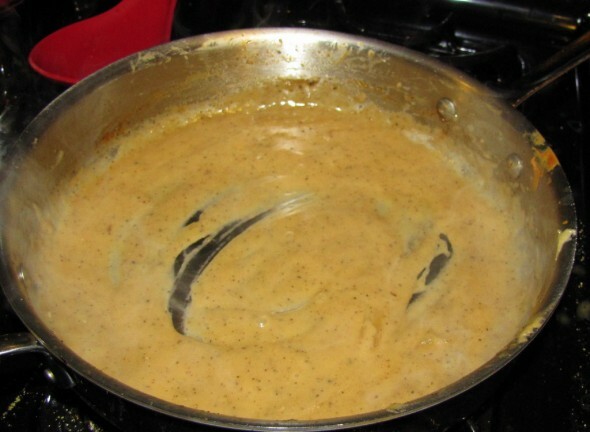 Continue to cook, adding more of the butter-flour mixture as needed to make a slightly thick gravy. Season with salt and pepper. Pour over the chicken and sprinkle with parsley. Toss the potatoes on a baking sheet with all the remaining ingredients. Make sure the potatoes are well coated with oil so they don’t stick to the cookie sheet. Roast the potatoes in the oven for about 15 minutes. Take the cookie sheet out and shake the potatoes to make sure they aren’t sticking. Put them back in the oven and roast for another 20 minutes. Then eat them! NOTE: I put the potatoes in while I prepped this chicken and shook them when I put the chicken into the oven. I left the potatoes in while I made the gravy for this dish, then I took everything out and served it. It’s hard to overcook the potatoes.